The most important topic to discuss for them who lost their cellphone and searching the web for the solution to track the phone. At the second, if someone bullying you then it's become very very important to track him down. Rex, one of my friends, one day got a call from an unknown number a man spoke to him with very bad language. He tried to track the phone number but he failed because the service providers do not allow us to do that. If they don't, then How can we track a cell phone with our own? This question often comes in our mind when we go to track someone down. But we forget one thing, i.e. nowadays every single person use the internet on their mobile. We can track them through the Internet. 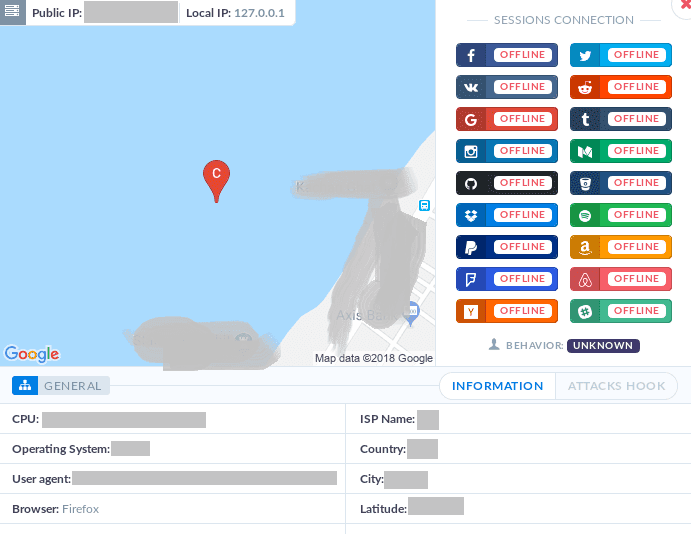 Here, we are going to discuss the way using which we can track any cell phone easily using a simple tool and a little social engineering trick. All you need is Kali Linux Installed in your system and an active Internet connection. The tool we're gonna use here is called Trape. Before begining the tutorial let's know a little about it. Trape is a Github script written in python. 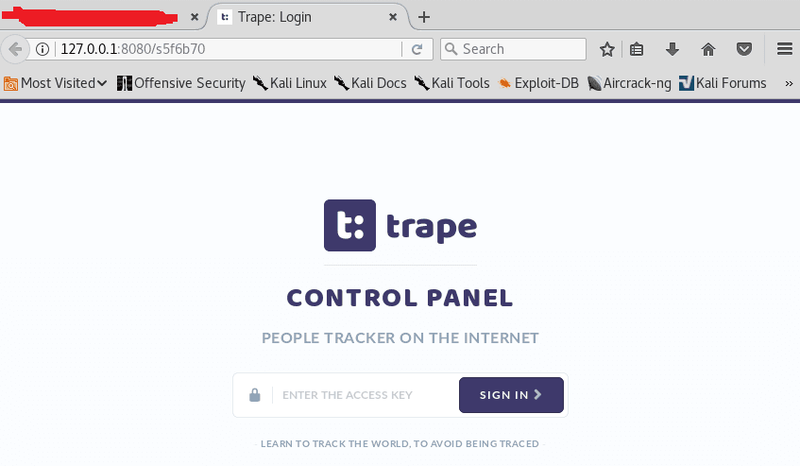 Using Trape we can generate a tracking URL for the victim. If the victim enters the URL, we will get the IP log in Trape's control panel. Basically, the tool performs browser hooking. Once the victim trapped, we can capture credentials, important details etc. We can get the real-time location too if the GPS is turned on. Also, we can check the login sessions of the browsers that the victim used. The tool recognizes facebook, twitter, VK, Reddit, Gmail, Github etc. popular sessions. Let's get to the tutorial. Fire up your Kali Linux machine and open up the terminal. It will download the tool on the desktop. You can change the directory to your own choice. Here, you will see a text file named as requirements.txt. This file is needed to install some necessary packages and library files to run Trape properly. This command will install all the necessary packages and subfolders automatically. But it's not a thing to worry. Trape will install the requirements its own but this step will help to speed up the installation process. Now, run the command python trape.py -h to see how to use the tool. Here it shows the command python trape.py -u <<Url>> -p <<Ports>>. We can use this command to run the tool. Now let us demonstrate how we can use the tool. Now type the command and hit enter. The tool will be loaded successfully. Here our Trape tool is running. Here we got two links and one access key. The first link is to trape the victim, the second is the control panel link and the access key is to access the control panel. All are okay but there is a problem. The link for the victim looks suspicious and if the victim is clever, he's not gonna get trapped. But there is a solution. Shorten the link using Bitly URL shortener. Ahha! now, all okay. Send the shortened link to the victim and wait for the victim to fall in the trape. Note down this point- The IP address 127.0.0.1 which used in the generated link is a local IP address and it will not work outside the local Network. 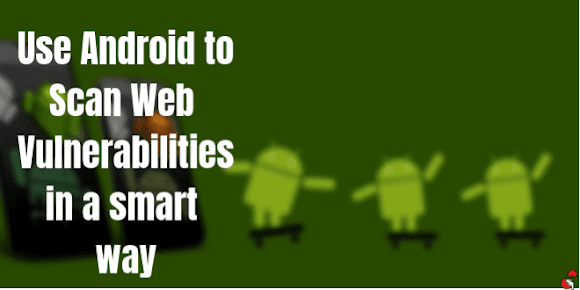 It will only work on the devices connected in the same local Network. But don't worry. NgRock tool can help us in this situation. Download Ngrok from here. It will be downloaded as a zip file. Extract it on the desktop and copy the Ngrok executable file from the extracted folder to the Desktop. Now clear the terminal and simply type the command ngrok http 8080 and hit enter. Here in the 8080 section, you can choose and forward any port number. Now you can see our 8080 port is online! Okay, at the end our problem with the localhost URL has been solved. Thanks to Ngrok. We can use the ngrok.io URL instead of the localhost. Now, copy the control panel link and paste & search in a browser. And copy the access key from the terminal and paste it to the login page. You will be logged in to the Control Panel Dashboard. Here you can manage the trapped victims. If someone clicks the link you will get his log in the Dashboard. To test the tool we opened it in another computer and we got the IP log. Now, look what you can collect from trapped IP address. Click on 'DETAILS' at the right. You will get the real-time location and the logged in sessions in the browser. But the location depends upon GPS. If the GPS of the victim is turned on, you will get the real-time location. Also, you will get the details of the device, about the CPU, Operating System, Browser, ISP Name. These details are enough to track someone down. If the sessions are active then the OFFLINE will become ONLINE. If it comes online click on the session icon to see and use it. One thing to note down. You can use the trapping link on many people. We should stop cyber bullies as much as we can. But we can't stay safe every time. In this case, tools like Trape comes in use. Playing with someone's feelings is not a good thing but that's what cyberbullies do. It's not nice mainly for a teenager. If you liked the tutorial let us know and if you have any problem with the installation or use of this tool feel free to comment us below describing your problem. Stay safe and have a joyful hacking journey. We do not promote any illegal activity on our blog. Perform it on others at your own risk. We are not responsible for any kind of damage caused by you. It is recommended to use it legally and stay safe. Use it only when you need it for good work. Ethical Hacking doesn't mean applying it to anyone without any legal reason. To do practice use your own property or if you want to use other's take written permission from them.